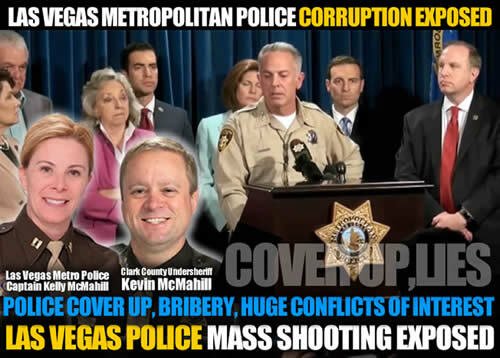 Captain Kelly McMahill and Clark County Undersheriff Kevin McMahill are hiding something from the public. The fact that Kevin McMahill has a shady past and was able to work his way back into Law Enforcement is a crime itself. This is how sociopaths and criminals get into positions of power and then end up abusing that power and victimizing more people. Take note at who was assigned to investigate the recent Las Vegas Mass Shooting and who has no background or experience. The Force Investigation Team (FIT) falls under the direction of the department’s Internal Oversight and Constitutional Policing Bureau that is commanded by Captain Kelly M. McMahill, who is the wife of Clark County Undersheriff Kevin C. McMahill. The FIT conducts a criminal investigation to determine whether the use of use deadly force was legally justified under criminal law., according the departments use of force policy. FIT also directs the investigation against a subject who either committed crimes which led to the use of deadly force or who has committed crimes against an officer. Why the investigation is not being handled by the seasoned homicide detectives of the LVMPD seems peculiar when juxtaposed with the fact that the police said that Paddock was already dead, apparently by his own hand, when they entered his room at the Mandalay Bay. Why a shooting investigation team that investigates if police officers were justified in using deadly force, would be investigating the mass Undershooting is unknown. The Las Vegas Metropolitan Police Department’s investigation of the worst mass shooting incident in United States history that occurred on Oct. 1 and resulted in the death of 58 people and the injuring more than 500, has had more twist and turns since Clark County Sheriff Joe Lombardo first held his initial press conference. The mass shooting and the death of the gunman, Stephen Paddock, who reportedly committed suicide, would normally be investigated by detectives from the LVMPD’s homicide division, however the Baltimore Post-Examiner was told by a retired police official that the investigation was pulled from homicide detectives and given to the department’s Force Investigation Team. Capt. McMahill is a staple on local television as the spokesperson for officer involved shootings in Las Vegas. McMahill is listed as a speaker at the November 2017 Conference of the Society for Integrity in Force Investigation and Reporting. She is scheduled for a talk on Las Vegas Metro Police Officer Involved Shooting Investigations. The FIT investigates all officer involved shootings leading to injuries or death. When the Baltimore Post-Examiner contacted the LVMPD Homicide Division on Tuesday and inquired if they were handling the Mandalay Bay shooting investigation, we were told that it was being investigated by the Force Investigation Team.